Although between one-third to one-half of world social sciences research literature is published in languages other than English, studies show very scant use of it by American and English scholars. Almost all studies, however, were conducted from the Anglo-Saxon perspective, limiting the scope of the study to English-published sources or English-speaking scientists and research workers. The present study aimed at assessing the scope of the language preference in a social sciences field, not only among American and British scholars, but among German and French ones as well, using the technique of citation analysis. 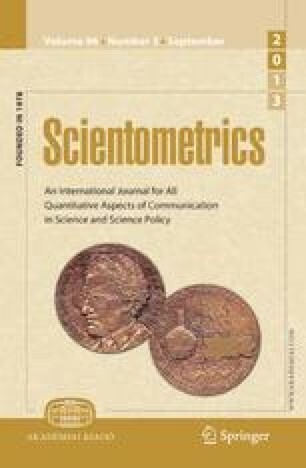 Samples including mostly 50–60 original research articles were drawn from the 1985–1994 volumes of nine leading sociology journals published in the US, UK, Germany and France and the references appended to each were scrutinized in order to determine the frequency distribution of the languages cited in each periodical. Findings clearly showed a strong preference of writers to cite material in their own language. However, the extent of this bias differed from journal to journal. The American and British writers rank first, with close to 99% of their references being in English. German scholars rank next, preferring German sources in 75% of the cases, and French scholars quote French sources in only 66% of their references. In order to calculate the new refined measure of ‘relative own-language preference’ (ROLP) indicator, the proportions of ‘language self-citation’ were related to the estimated proportions of these languages in the existing body of sociology research. This measure reveals that German sociologists have the strongest bias towards their mother-tongue, their ratio of references in German exceeding almost 12 to 28 times the expected figure according to the German language share in sociology research. Next come French sociologists (8 to 14 times) while American and British ones display the lowest own-language bias, only slightly higher than expected. Further analysis of the foreign languages preference of each group, according to a ‘mutual-use’ matrix, shows a relative low use of German and French sources by British-American sociologists.